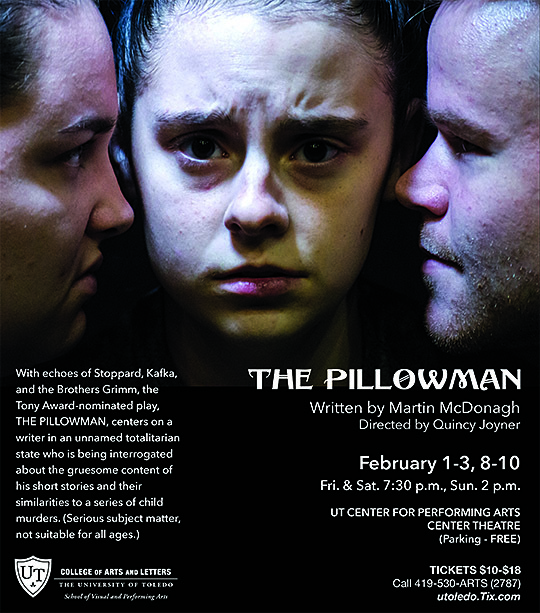 The University of Toledo Department of Theatre and Film will present Martin McDonagh’s Tony Award-winning play titled “The Pillowman” Friday through Sunday, Feb. 1-3 and 8-10, in the Center for Performing Arts Center Theatre. Friday and Saturday performances will be at 7:30 p.m.; Sunday shows are at 2 p.m. In “The Pillowman,” Katurian, a fiction writer abused as a child, churns out bizarre novels with violent plot twists that raise the suspicions of the police when his stories align a little too closely with a recent string of child murders. During his interrogation, Katurian reveals the horrid childhood experiences that informed his craft. Quincy Joyner, assistant lecturer of theatre, is directing the production. The cast features Hanna Gerlica, a junior majoring in pharmacy, as Mother; Bryan Harkins, a senior majoring in theatre, as Tupolski; Becca Lustic, a junior majoring in theatre, as Michal; Abbey Mulinix, a student at Wildwood Environmental Academy, as Little Jesus Girl; Grace Mulinix, a freshman majoring in theatre, as Katurian; Faith Murphy, a junior majoring in theatre, as Ariel; Justin Petty, a sophomore majoring in theatre, as Father; and Christian Soto, a freshman majoring in theatre, as Pillow Boy/Brother. Members of the design team are Dr. Edmund Lingan, professor and chair of theatre and film, producer; Scott Hunt, UT alumnus and faculty member, composer; Kristin Ellert, set designer; Daniel Thobias, associate professor of theatre, costume designer; Stephen Sakowski, assistant professor of theatre, lighting designer; Ryan Peters-Hieber, a senior majoring in theatre design technology, sound designer; Kevin Upham, a senior majoring in theatre, stage manager; and Logan Fleming, a sophomore majoring in theatre, assistant stage manager. Tickets are $10 for students; $12 for UT faculty, staff and alumni, and military members and seniors; and $18 for the general public. Call 419.530.ARTS (2787) or go to the School of Visual and Performing Arts’ website. Tickets also will be available at the door. This entry was posted on Wednesday, January 30th, 2019 at 3:47 am and is filed under Alumni, Arts, Arts and Letters, Events, News, UToday .